Here in Miami, we just accept humidity as a way of life. It’s a part of us. People from the Southwest will probably never understand it like we do. We’ve accepted it for a long time now. 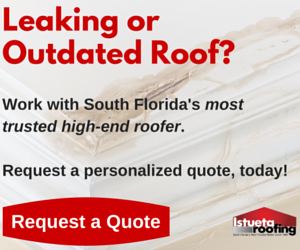 As a roofing contractor in Miami, though, we tend to think about humidity in a different way. Since the humidity is a big part of your everyday life, you may not realize what sort of effects it has on your home. More specifically, you may not realize what it can do to your roof. Or do because of your roof. Outdoor humidity impacts a home and its roof’s longevity, but indoor humidity can do the same thing. Excess moisture can expedite the water damage process for your roof, but if your attic itself is affected by excessive humidity, it can cause mold, rot, and even weaken your home’s structural integrity. If you’re planning on having a new roof installed soon, or planning on having maintenance done on your current roof, there are a few things to keep in mind when it comes to the humidity. Basically, you’ll want to make sure you do your due diligence when it comes to finding a roofing contractor and selecting any roofing products. First, the contractor– your roofing contractor should have a long, provable history of working in Miami’s climate. You’ll also want to make sure they’ve worked with your desired roofing materials before. If you have questions about humidity and roofing, they should be able to answer all of them without a problem. Next, you’ll want to look at roofing products. Make sure your materials are certified, if not at least confirmed, to be acceptable for use in Miami’s climate. If you want to do further research, look no further than Miami-Dade’s website. And, lastly, if you see any signs of water damage after a storm, contact a roofing contractor in Miami immediately. The sooner you work to mitigate water damage, the fewer complications you’ll have in the future. So, what’s the best thing you can do to fight back against the effects of humidity? Keep the inside of your home dry. You want to keep the moisture in the air to an absolute minimum. This can include using a dehumidifier, especially in or near your attic. But there’s one thing that’s much more effective than a dehumidifier, and you don’t even have to plug it in– a proper roof and attic ventilation system. An attic ventilation system should be installed with any new roof, but many homes have roofs that were installed quickly by unmotivated contractors. A good ventilation system constantly reduces indoor humidity, and makes your home’s roofing system last much longer than it would in humid conditions. There’s one last thing you can do to fight back against humidity. Have your roof inspected by a professional at least once per year. If your trusted contractor notices any damage, they’ll tell you immediately, and formulate a plan that works to ensure the integrity of your home, your roof, and your largest investment. Have more questions about humidity and your roof? Contact us for more information!